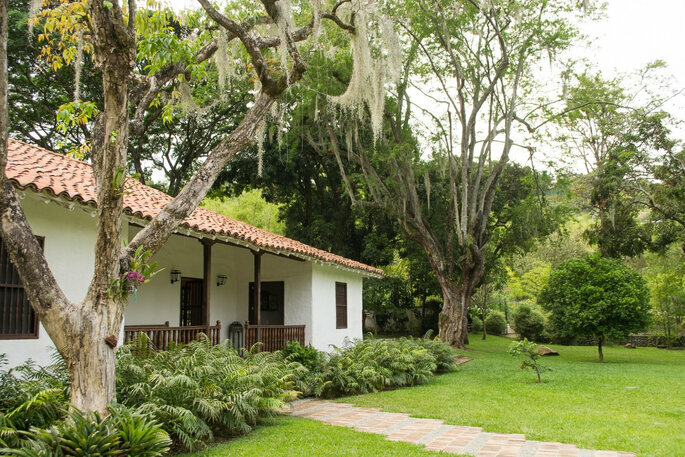 If you’re a city couple, looking for some escapism and magical scenery for your destination wedding, you’re probably seeking a charming rural venue in beautiful Colombia. There are so many places in Colombia for a rural-chic destination wedding, whether the lush tropical rainforest or golden coastline. This South American country really has it all, especially for a unique wedding like no other. Well, to narrow down your search, let us take you to Cali, and more specifically, Hacienda del Bosque, where you’ll find the atmosphere, details and all the extra special touches you need to make your wedding an unforgettable one. A 19th century estate, nestled in nature, on the outskirts of Cali. Hacienda Del Bosque offers couples first-class food and service, as well as marvellous views of a lush tropical landscape as far as the eyes can see. 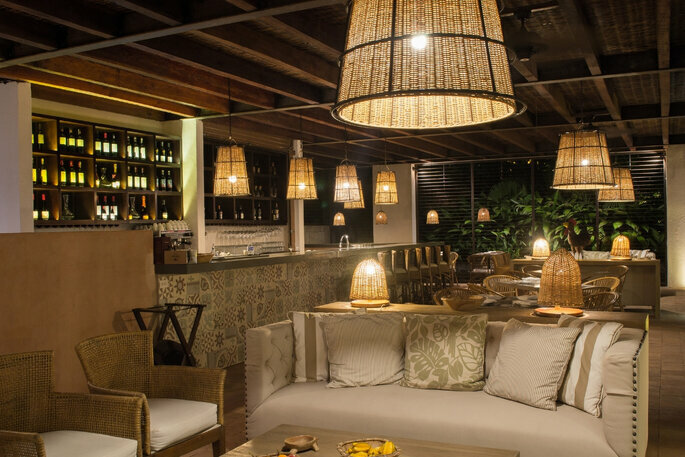 It’s a very old house, perfectly conserved and renovated, with large green areas, an extraordinary climate, and three reception spaces: the Main Dining Room, La Pesebrera and the Bar, and the authentic Colonial Salon. This beautifully renovated farm-house is the definition of rural elegance, and it’s an escape from the hustle and bustle of the city centre, without being situated too far away. On the banks of the Cali River this hideaway maintains its historic charm too, with authentic wooden beams and wicker furniture. 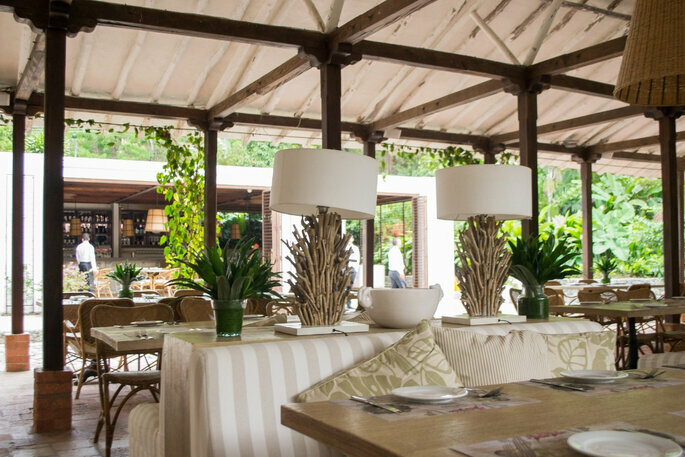 Every member of staff at Hacienda del Bosque counts on a wealth of experience, which allows them to provide a flawless venue space for events. There is also an executive chef who is renowned in Cali for his exquisite culinary skills, innovating new dishes with seasonal ingredients. 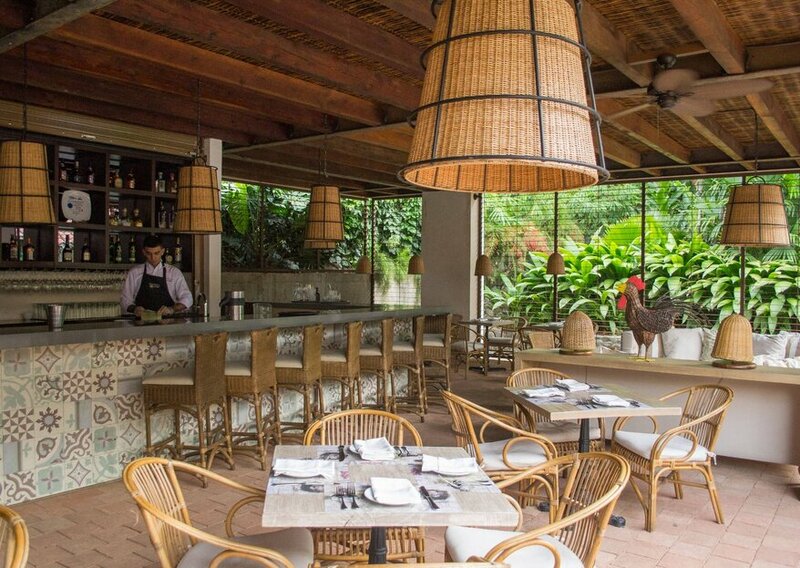 Hacienda del Bosque offers its guests a menu designed by Chef Francisco Prado that allows celebrates the evolution of Colombian cuisine fused with unique textures and flavors. And when it comes to wine, there’s more than thirty delicious options to complement each dish. 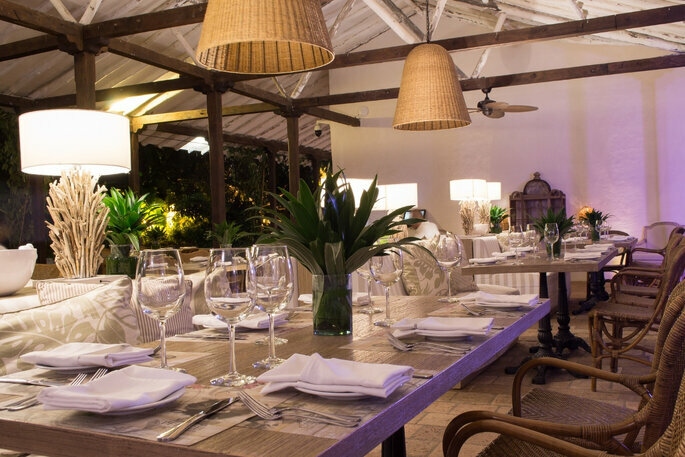 But what else makes Hacienda del Bosque the perfect venue? Well, it’s possibly the most beautiful countryside venue in the whole of Cali, with a privileged location, easy access and parking. The nearest hotel is just five minutes away, which will be very convenient for your esteemed guests. The capacity of the entire house is 200 people, but larger weddings can be held outdoors in the large green spaces, where celebrations of up to 350 people can take place! The Main Dining Room seats up to 90 people, the Bar 40 people and the Colonial Salon 42 people – all of which are great spaces if you’re looking for a more intimate destination wedding celebration. 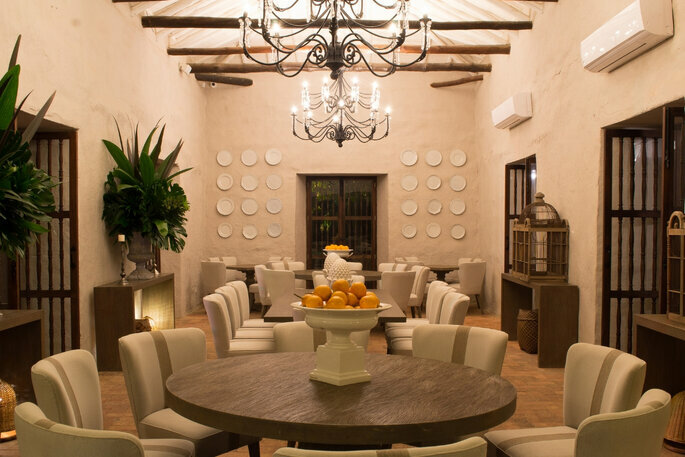 Hacienda del Bosque will be your romantic home away from home; a place that keeps the history of its ancestors while flaunting contemporary good taste and innovative cuisine. 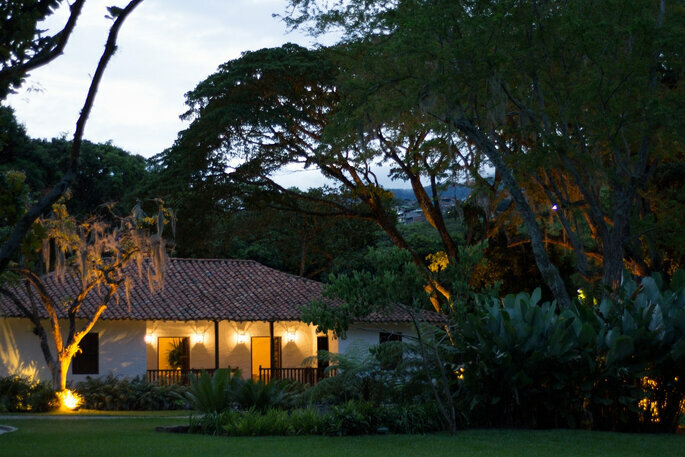 Here you’ll experience not only an incredible wedding day, but a unique cultural and travel experience, to colonial history nestled among the tropical Colombian forest. Picture-perfect beauty. Portugal is one of the most beautiful countries in the world, and is becoming increasingly popular for Destination Weddings - so check out our choices of the best places to get married in this amazing country! Guest blogger Kacey Bradley returns to tell us all about why you shouldn't discard a hotel as the perfect venue for your wedding day - discover why today! A luxury venue in the Burgos province of Northern Spain, the Hotel Castilla Termal Monasterio de Valbuena is the perfect location for your dream Destinatin Wedding! There are simply too many wedding venues in the US to count - but if you're looking for something a little different, with that extra touch of magic (and that'll make your friends very jealous! ), then check out our exclusive look now! Zankyou has brought together their absolute favorite wedding venues from all over the world for you to take a look at - scroll through our gallery now for inspiration for your Destination Wedding! Fancy saying "I do" in one of the most popular wedding destination choices? Check out all Portugal has to offer to make your dreams come true! For those of you seeking a destination wedding venue in Colombia, would you really choose anywhere else? 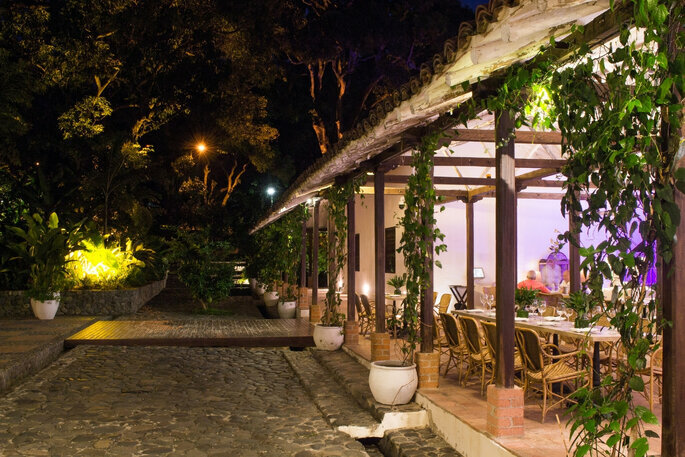 Hacienda La Pampalinda suits all wedding sizes, all wedding themes, and has stunning locations for an emotional ceremony and fun reception party.